In “Close Up Space,” the Russian language expresses a gulf of grief between father and daughter. Imagine your teenage daughter suddenly starts speaking a different language you don’t understand - then again this happens to everyone who has children. In “Close Up Space,” which officially opens tonight at Manhattan Theatre Club’s City Center stage, Harper (played by Colby Minifie) gets kicked out of boarding school. 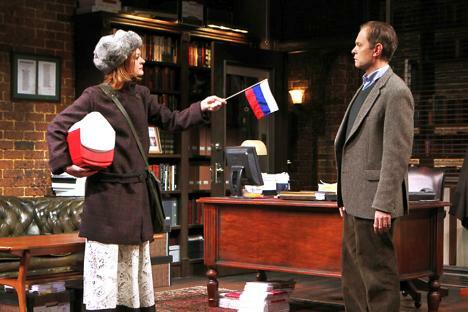 The 18-year-old returns to New York and refuses to speak anything but Russian to her bewildered father. MOLLY SMITH METZLER (Playwright) grew up in Kingston, New York. She is the author of Close Up Space (Manhattan Theatre Club), Elemeno Pea (Humana Festival 2011, upcoming: South Coast Rep), Training Wisteria (SPF, Cherry Lane Mentor Project) and Carve. Her work has been developed by The O’Neill Theatre Center, MTC, Chautauqua Theater Company, Williamstown Theatre Festival, hotINK, Playwrights Horizons, and The Kennedy Center, where she was the winner of three KCACTF awards. Molly is a member of EST, Ars Nova Play Group, and Primary Stages writing group; she is a graduate of SUNY Geneseo, Boston University, NYU Tisch, and The Juilliard School, where she was a two-time recipient of the Le Comte du Nouy Prize from Lincoln Center. She lives in Brooklyn. The fast-paced, acerbic play—which began previews December 1 - spins comedy out of tragedy, showcasing the joyful talent of Molly Smith Metzler, a 33-year-old playwright whose own day job as an editor may soon come to an end. The title of the play, “Close Up Space,” refers to the editing symbol used to tighten up the space between letters. It could also more loosely refer to closing up the space between people stricken by anger, grief and fear. And believe it or not, the work is a comedy. The play is directed by Leigh Silverman, who recently earned kudos for her direction of the play “Chinglish,” another play about miscommunication. Hyde Pierce’s character has a fierce passion for editing that is utterly useless when he raises his eyes from the page. He can’t talk to his daughter who burns with anger, and the Russian language becomes a metaphor for the abyss between them. Paul Barrow (Hyde Pierce) is a man who speaks editor; Vanessa, his high-maintenance Diva writer (played by Rosie Perez), speaks woman. The intern, Bailey, speaks both Vassar and Urban Outfitters, according to Metzler. Barrow’s assistant (Michael Chernus) is a fun-loving, caretaker type who can’t fax or make calls, happens to be homeless and camps out in tents in the office (the play was written before Occupy Wall Street). Hilariously, he understands Harper’s Russian perfectly and becomes a therapeutic go-between. Most of the audience of non-Russian speakers will feel some of Paul’s frustration as Harper speaks. What is she saying? Colby Minifie, who is playing an American student obsessed with Russia, also learned Russian for the part, working with a Russian coach. But in the script, her feelings come across louder than her words. More than once, the words of one of Russia’s most revered poets, Anna Akhmatova, escape her mouth like blood on stone. The playwright grew up in Kingston, New York, taking Advance Placement classes and going into Manhattan frequently to plays and museums. “I credit my family with a lot. We were a Royal Tannenbaum kind of family, very overachieving,” she said. “The Royal Tannenbaums” was a 2001 film about a family of eccentrics and estranged prodigies, itself reminiscent of J.D.Salinger’s famous Glass family. Metzler does not give off any whiff of Franny Glass however. She has a disarmingly generous disposition, and an unassuming way about her, as if she was still waitressing on Martha’s Vineyard. (Another promising play, “Elemeno Pea,” is inspired by her time serving wealthy patrons on the island, including a woman who asked her to “take the potatoes out of the clam chowder” because she was on the Atkins diet.) Metzler’s razor-sharp bite appears to be hugely disciplined, and wholly subsumed directly into her characters. In the play “Close Up Space,” Harper doesn’t speak English for good reason, it turns out. Russia is Harper’s intimate language of protest, of expression, of bearing witness to injustice and grief. Her mother, Gloria, a lyrical writer, committed suicide a few years before the play opens. Harper’s father, Paul, was editor to his wife poet. After her death, he sends his daughter away and boards up their house, a hideously imprecise way of dealing with the emotions he cannot even name. Metzler’s own writing process involves visual techniques, including taping up photos of actors who might play her characters. She said that the characters let her know what direction they want to take, and that she identifies with some of them more than others.